NEW Coastal Club Resort OCEAN BREEZE Beach House in Lewes DE w 4 BR, 4 Baths, 2 MBR Suites, Sleeps 10, 4,000 sq ft! 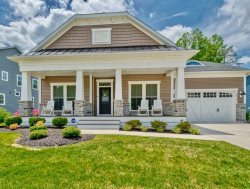 BRAND NEW SINGLE FAMILY WATER-FRONT VACATION HOME located at COASTAL CLUB RESORT in LEWES, Delaware. 3 full baths and 1 half bath. Sleeps a maximum of 10 (STRICT LIMIT) $35 per person per night charge if guests exceed booking quantity. This home has security cameras mounted on the outside of the home. Gourmet kitchen is "to die for" with new stainless steel appliances, granite countertops, dishwasher, microwave,disposal and natural gas range! Lofty Ten-Foot (10') ceilings provide an open and spacious feel of peacefulness and relaxation. New Sealy matresses for your snoozing pleasure. Waterfront home sits in front of a small lake with fountains. Watch wonderful sunsets from out back. Two Huge 65" HDTVs including 1 in the downstairs Entertainment Room. Just moments from Downtown Lewes, Coastal Club is an extraordinary resort destination, situated around a 42-acre nature preserve with 5-acre pond, bordered by rolling woods and offering amenities unlike any other community in the Lewes and Rehoboth area. Coastal Club puts you moments from the beach and close to everything you love about beach life. You can easily head over to Rehoboth Beach for the day, or enjoy fishing on the waterways and ocean. You can also explore Cape Henlopen State Park or head over to nearby Route 1 for the area’s best shopping. Local eateries include Agave Restaurant, Striper Bites, The Buttery and Touch of Italy. COASTAL CLUB RESORT: Imagine vacationing in a community so rich with amenities that you never want to leave! Located just moments from downtown Lewes, Coastal Club is an extraordinary resort destination, situated around a spacious nature preserve with a peaceful pond, bordered by rolling woods. Begin your day enjoying the sights and sounds of nature along the three-mile Eagle view trail. Enjoy a game of tennis or bocce ball with family and friends. Grab a cup of coffee at the Lighthouse Club, then take a dip in the incredible infinity pool and enjoy a cocktail at the only swim-up pool bar in Delaware. No matter what you’re looking for in a resort community, it’s all right there at Coastal Club! Begin your day enjoying the sights and sounds of nature along the three-mile Eagle view trail. Then take a dip in the incredible infinity pool and enjoy a cocktail at the only swim-up pool bar in Delaware. The pools were built and operational in 2016 so they should be ready for a 2017 grand opening around Memorial day weekend. Recreational passes to use the resort amenities. You do not have to purchase any passes if you don't want to - purchase only for those who'll be using the resort amenities at the Lighthouse club - just a short walk away from your vacation home. The Lighthouse club has quoted prices of $15 per day pass or $40 per weekly pass - smaller children will not need a pass - they'll just need to be accompanied by an adult. At Coastal Club, you will experience the adventure of a lifetime. The Clubhouse is your hub for recreation and socialization, with a state-of-the-art fitness center; an outdoor pool with swim-up bar and a water playground for the kids. You’ll also love strolling along the 3 miles of wooded walking trails. The clubhouse features a fitness center with separate yoga studio, a coffee lounge, a grand bar with a professional kitchen and a game room. * Lead renter must be over 25 years old and take responsibility for everyone in the group. * If you break any of these rules, you can be immediately evicted and lose all payments made including security deposit.